Since I first read about the "Tartan Parade" linky party, I have had my eyes open for tartans, everywhere I went. I really thought it would piece of cake to find tartans at my local antique and consignment shops. There must be plaid linens, lunchboxes, picnic baskets, thermos, etc to pick up and build a vignette around! I was panicking by last Friday, with still no tartans. Sooooo I am taking a "wee" bit of creative license with my "tartans" parade entries. Yes, ENTRIES, I have more than one! I had my poor daughter search a big rubbermaid tub in her closet for a Ty Beanie Baby Scottie dog for my lassie to hold in her photographs, but no luck. The black beanie baby dog I remembered was a black poodle. Anyway, my wee bonny lassie is really MY lassie. She was my doll as a child. 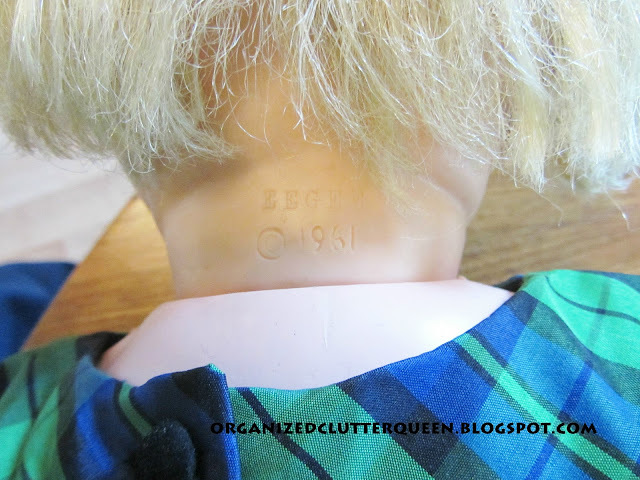 She usually stands next to Terri (another of my vintage dolls) in our den among my vintage toy collection. Her EEGEE Copyright 1961 mark. No batteries but she walked if you cranked on her legs and arms just right! 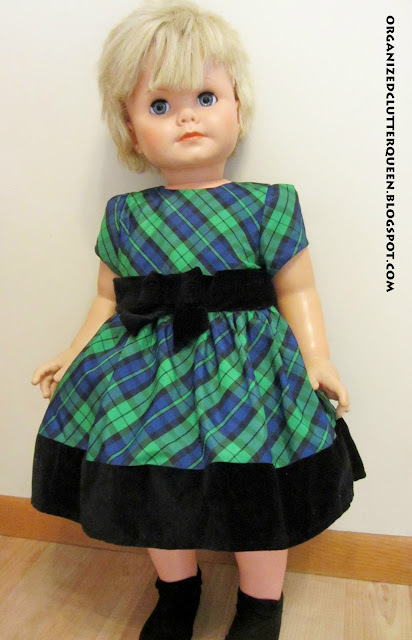 I hope you enjoyed my lassie in a tartan (plaid) dress! Carlene, your wee bonny lassie is adorable. Her new frock is certainly pretty. She is definitely going to be the best dressed at the parade. Super! I really like the plaid colors in this dress. I have actaully seen quite a few neat plaid dresses for little girls this Easter season, and it has amazed me. they were mostly in yellows and pinks. 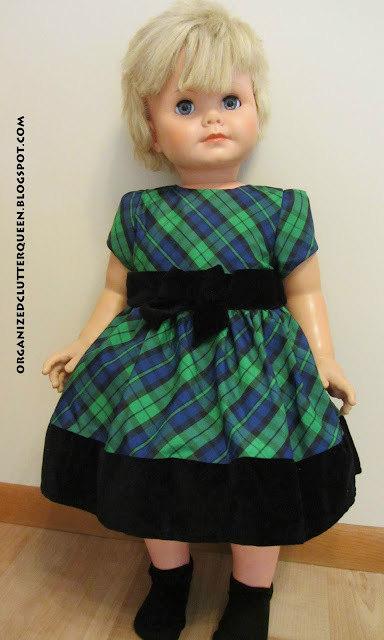 This dress maintains the vintage quality and look of the doll. 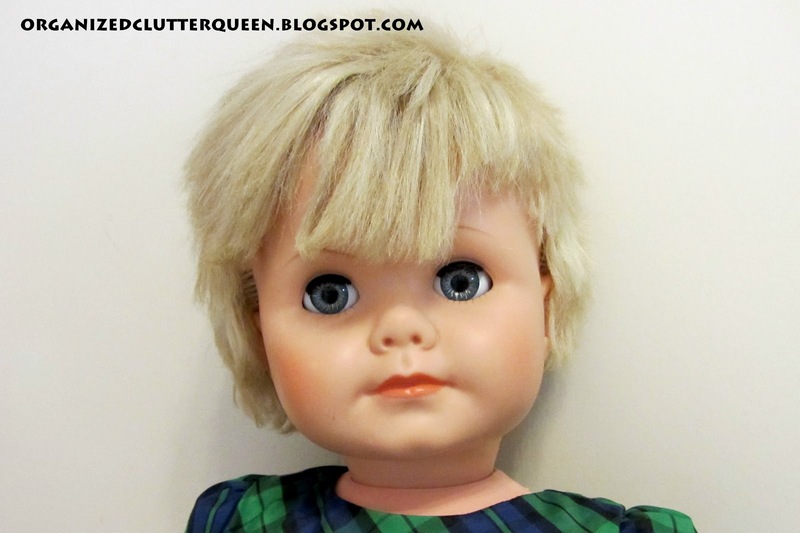 I keep looking at the doll's face, though, and thinking she looks like someone I know. I can't pinpoint who that is, though, and it's driving me nuts!!! This is just the sweetest post, Carlene! I am so impressed and touched that you actually went shopping to come up with something to post in the Parade today! Bringing your sentimentally sweet bonny lassie is so clever! You take the cake! I had a walking doll when I was little too and your baby's little face looks familiar to me but I think mine had long blonde hair. Mine might have been battery operated? I wish I still had her! Thanks so much for sharing your wee baby with us at the Tartan Parade today! 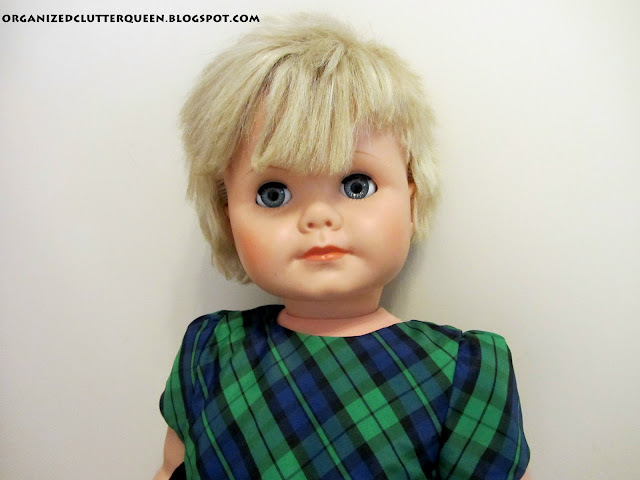 YOur wee bonnie lass is adorable, especially in that darling plaid dress! I had a doll similar when I was little, but she didn't have that dress. Thanks for sharing. Cute doll! Love the dress. Your doll is very sweet. Love her plaid dress. What a great keepsake. Have a wonderful Easter and thanks for linking up to Share the Love Wednesday! She is an adorable treasure! Thank you for sharing with us at TTF. I hope you and your family have a happy and blessed Easter!